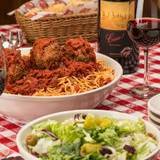 Buca di Beppo is the perfect location for your next group dining event. Whether you are looking for an ideal space for business meals, personal celebrations or large social gatherings, treat your guests to an always fun and festive atmosphere. Enjoy sharing our delicious Italian food your meal with colleagues, friends or family served family-style. Our location features eclectic décor, unique ambience and uniquely themed tables and semi-private rooms. Whatever the occasion, our group event team will help you put together a successful group dining plan tailored to meet your needs and budget. Please fill in your information below and Chelsea Libreros will contact you as soon as possible to book your event. If you’d prefer to talk now, please call us at (877) 955-2822.